Often when I wander the streets of large cities, I relish the fact that by simple probability, a good coffeehouse could be nearby. Granted, my luck has not led to many random finds but the numbers still tell me that hope still exists. Yet when I'm in small towns where I've already pegged two or three coffeehouses, I'm not really on the lookout for another (the probability does not exactly thrive). And on those exact moments where you look not for something, you often find it (such as in love and in suffering). 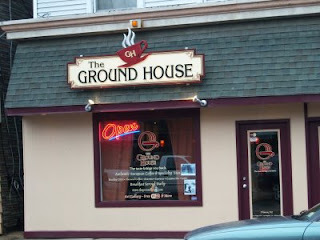 So was the case in my most recent trip to Pitman, a small town in NJ that already sports two coffeehouses (one decent, one fair) where I was pointed to a third coffeehouse called The Ground House. Naturally, I ventured over. The exterior is but a tan and maroon flat face with a window having the appearance of what I would deem a jazz club. The interior is a two room venue that reflected quite the dichotomy; the main room (the one with the food) holds a reddish decor with nice mood lighting while the adjoining room with their substantial stage is bright white and green with rather bleh fluorescent lighting. As per the barista's heavy discretion, the coffee comes from "Millville," which from my basic powers of deduction means either they get their coffee from Kaffe Magnum Opus or a secret roaster untold (Millville isn't that big either). Either way, their house coffee (an Ethiopian) was concocted on a hot plate brewer and had some bright notes with some smoothness, but overall it proved boring and not too savory. The espresso lent similar effects, as it held some enjoyable elements of acidity though overall it lent more heavy char and made for only a fair cup. The tea comes from David Rio. To say the least, I was happy to find the place even though some of the facets of their coffee seem to warrant small improvement. No matter, give the Ground House a try if you happen to wander the streets of Pitman looking for coffee. A great place to hang with others, and wonderful bands. Check out 'open mic' nights, you'll be in for a real surprise. The Ground House can easily become a 'home' and a wonderful place to connect with friends for good food, great music and ...Jim Six is a local singer songwriter great to listen to. He is there most Saturday nights in the next few months from 7-9. Join him and us for a great time! !